Download My Big Fat Greek Wedding 2 in Digital HD from the iTunes store. 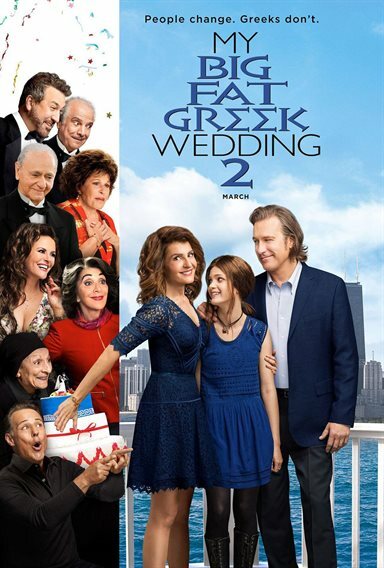 My Big Fat Greek Wedding 2 images are © Universal Pictures. All Rights Reserved. Opa! Nia Vardalos (Connie and Carla) does it again. A sequel 14 years in the making, My Big Fat Greek Wedding 2 has all the laughs and emotional baggage we loved the first time around. All of our favorite characters return to remind us of the craziness surrounding the Portokalos family, while they navigate through new challenges… including technology. Toula Portokalos is going through an identity crisis. She no longer knows where she fits into her daughter, Paris', life while she struggles with remaining the good daughter and wife. She is desperate to hold on to her baby girl, who is almost ready to leave for college, yet longs to break free, herself, from the stranglehold that her big, Greek family has over her. When her father (Michael Constantine; Cold Case) accidentally discovers he and Toula's mother (Lainie Kazan; Beaches) were never actually married, Toula feels the need to fix everything and hilarity ensues as the family plans yet another big fat Greek wedding. Meanwhile, Paris is desperate to get as far away from her overbearing family as possible deciding to attend NYU for College. If that wasn't enough Toula is trying to balance all that while rekindling the romance in her own marriage to Ian (John Corbett; Parenthood). Part of what makes this movie so much fun is the cast. From Vardalos to Corbett and Constantine, Kazan, and every one in between, the comedic timing is spot on and serious delivery of such obviously hilarious dialogue is terrific. Especially noteworthy are Andrea Martin (Sesame Street) as Aunt Voula and relative newcomer Elena Kampouris (Labor Day) as Paris. Vardalos takes this family on more of an emotional journey than the last go around which makes the script fresh and avoids the movie from falling into the same old rut that many sequels face. While there are moments of "we've seen this before", there are also so many laugh out loud funny scenes that are truly enjoyable. Anyone from a large ethnic family can relate to this one and can see themselves in at least one of the characters. There are some times when less is more and the Windex joke would have been better off as a one time gag than the few times it was add to this film. Also, a few of the technology jokes made this family seem a little "buffoonish" and unnecessarily daft. It's certainly not cinematic genius, and I don't see it winning any awards, but for a fun night out, it a good choice. At the end of the day, when you need an escape from your close-knit family and a few hours of true belly laughing, My Big Fat Greek Wedding 2 is a great option.